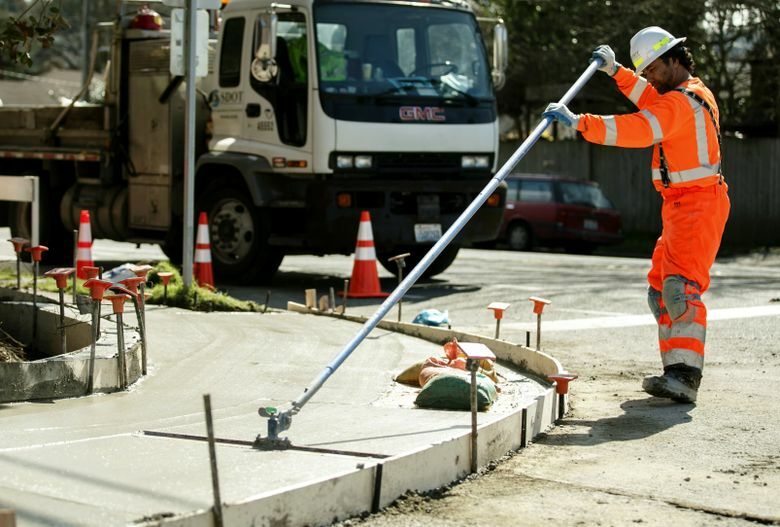 Can Seattle increase sidewalk curb-ramp construction without any new money? It says yes. A lawsuit settlement requires that Seattle dramatically increase the pace at which it builds sidewalk curb ramps at intersections, which make it easier for disabled people to get around. From 2007 to 2015, the nine years covered by Seattle’s Bridging the Gap transportation levy, the Seattle Department of Transportation built about 3,000 curb ramps, which allow people in wheelchairs to cross streets and access sidewalks. Next year, in just one year, Seattle will have to build 1,250 curb ramps. And to comply with the terms of a recently settled class-action lawsuit brought by disability-rights advocates, the city will have to keep up that accelerated construction pace for the next 18 years. While the average cost of each curb ramp is disputed — in nearly two years of negotiations, the plaintiffs’ and the city’s attorneys could never agree on a number — they’re not cheap. A city-commissioned study last year put the average price at nearly $13,100 per ramp. That number yields a total cost of nearly $300 million in curb ramps over the 18 years covered by the settlement — although not all would be funded by the city. City officials say they can absorb the spending without any increased funding and without dropping other scheduled projects. Accusing the city of noncompliance with the Americans with Disabilities Act, three men filed the lawsuit in 2015, after negotiating with the city for more than a year before that. So, when voters approved the $930 million Move Seattle transportation levy in 2015, money for curb-ramp improvements had already been factored into future spending plans, said Scott Kubly, director of the Seattle Department of Transportation (SDOT). Kubly said that as the city negotiated the settlement, it did so with an eye toward what it would be able to do with existing funds. The Move Seattle levy provides funding for nine years, while the curb-ramp settlement lasts for 18 years. Kubly said that in their financial planning, the agency assumed the money would be replaced, likely from another levy, once Move Seattle ends. Still, the increase in ramp construction from current rates will be significant and the city will also have to pay about $1.5 million in legal fees to the plaintiffs’ attorneys. Since January 2016, in the first 18 months that the Move Seattle levy has been in effect, the city has built 408 curb ramps. The levy’s goal for all of 2017 was 350 new curb ramps. Halfway through the year, 53 have been built. But between now and the end of the year, to comply with the settlement, the city will have to build 625 curb ramps in just over five months. The city’s Pedestrian Master Plan, newly updated in March, anticipates curb-ramp improvements at “up to 750 intersections” over the nine years of the Move Seattle levy. A standard four-way intersection has eight curb ramps, which would yield up to 6,000 curb ramps over nine years, far less than the 11,000-plus required by the settlement. Kubly said the city is now doing a better job of tracking the ramps that it does build, so every one gets counted toward the total. Also, the city will look at putting out larger contracts for curb-ramp construction to try and lower per-ramp costs. The first year of the Move Seattle levy, he pointed out, had less spending than anticipated as major projects were designed and planned, with construction to accelerate down the line. One mitigating factor for SDOT is that every curb ramp built or improved in Seattle will count toward the required total, no matter who builds it. So every ramp built by a private developer or Seattle Public Utilities means one less ramp that SDOT has to build. But “the vast majority will be built by SDOT,” said Linda Dardarian, one of the plaintiffs’ attorneys in the lawsuit. She estimated that somewhere around 80 percent of the curb ramps would ultimately have to be built by SDOT. Despite the daunting numbers, Dardarian said she believes the city will be able to meet its requirements, pointing to the voter-approved levy as the crucial funding source. Correction: Information in this article, originally published July 31, 2017, was corrected July 31, 2017. A previous version of this article misstated the number of curb ramps the Seattle Department of Transportation built from 2007 to 2015. The department built about 3,000 curb ramps.